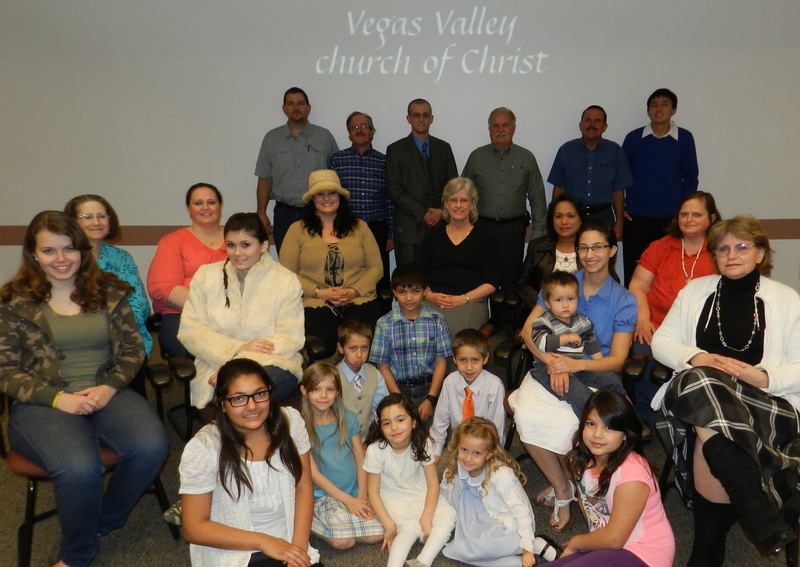 "Let The Word... Dwell In You"
We are the Vegas Valley Church Of Christ. We're not the only church of Christ; there are others (Romans 16:16), each distinguished by location (1 Corinthians 1:2; 1 Thessalonians 1:1), but every one of which should maintain consistency with the doctrine set forth by the Lord's apostles (Acts 2:42; 1 Corinthians 4:17; 7:17). Those churches which drift away from the truth may be disowned by Jesus (Revelation 2:1-5); therefore we withhold blanket endorsements of all that claim to be churches of Christ (Ephesians 5:11). Instead, we encourage those who seek the truth to examine each congregation in comparison to the scriptures. Although there are many churches of Christ spread out geographically, there is a sense in which there is only one church. The church is the body of Christ (Ephesians 1:22-23), of which there is only one (Ephesians 4:4). Admission into this body is achieved through baptism (1 Corinthians 12:13), the same action whereby one enters Christ (Galatians 3:27; Romans 6:3), whereby one is saved (Mark 16:16; 1 Peter 3:21), and whereby sins are expunged (Acts 2:38; 22:16). Thus the one body, the church in its universal sense, consists of all saved people. Inasmuch as the church is the people saved by Christ, the cost of our salvation (Ephesians 1:7; Colossians 1:14; 1 Peter 1:18-19) is the same price paid to purchase the church (Acts 20:28): nothing less than the blood of Jesus Christ. The church is, therefore, very valuable to God, and its worth must never be understated. The church is the setting in which God is to be honored, as Paul wrote, "Now to Him who is able to do exceedingly abundantly above all that we ask or think, according to the power that works in us, to Him be glory in the church by Christ Jesus to all generations, forever and ever. Amen" (Ephesians 3:20-21). We aim to glorify God through our praise of Him (1 Peter 2:9). The church serves an eternal purpose. The apostle Paul said, "now the manifold wisdom of God might be made known by the church to the principalities and powers in the heavenly places, according to the eternal purpose which He accomplished in Christ Jesus our Lord" (Ephesians 3:10-11). The reason God established the church, and it was always in His plan to do so, was to make His wisdom known. Thus, "the church of the living God" is identified as "the pillar and ground of the truth" (1 Timothy 3:15), meaning that its mission is to uphold the truth. Each local church can accomplish this goal, fulfilling the Lord's plan of worldwide evangelism (Matthew 28:19-20; Mark 16:15-16). Addressing "the church of the Thessalonians in God the Father and the Lord Jesus Christ" (1 Thessalonians 1:1), Paul commended their success in spreading the gospel, saying, "from you the word of the Lord has sounded forth, not only in Macedonia and Achaia, but also in every place" (1 Thessalonians 1:8). It is our goal to accomplish the same as the Thessalonians, broadcasting the truth of the gospel near and far. The Lord also assigned to the church the task of edification, which means to build itself up (Ephesians 4:11-16). This means we promote each other's individual spiritual development (2 Peter 3:18). We do this by assembling regularly for mutual exhortation (Hebrews 10:24-25). In pursuit of our purposes, we have no use for the denominational churches established by men, nor for their theological institutions, seminaries, or missionary societies because we know Jesus said, "every plant which My heavenly Father has not planted will be uprooted" (Matthew 15:13). We consider His church sufficient for the purposes He gave it to fulfill. In short, the mission of this church is to glorify God (Ephesians 3:21), make known His manifold wisdom (Ephesians 3:10), uphold the truth (1 Timothy 3:15), and build each other up (Ephesians 4:11-16).